A bill introduced in the U.S. House of Representatives would end tax breaks on vessels qualifying as second homes. Typically, these are boats that have a galley, head, and berth and are 26 feet or longer. Sans Souci is in the Med! Great news reported from Ken Williams. His trawler, Sans Souci, made it to the Med aboard the freighter it has been traveling aboard. 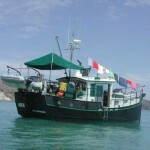 Sans Souci is a Nordhavn 68 trawler. Great News! 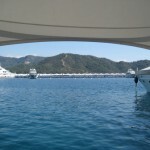 Check out the shot of the beautiful blue Turkish water!